Summer has reached the “dog days,” and it’s hot and muggy! Eastbrook Construction is your local roofing company near Brighton and we are working through the heat! With summer comes a lot of responsibility with your home and yard appearance. Homeowners work hard to make their lawns and landscape look beautiful for these warm months where everyone enjoys outdoors. Don’t let your roof be the improvement to get neglected this year. If you notice it, chances are your guests will too! It may be hard to tell if you need a roof replacement. It may be more superficial and repair and in some cases with certain types of stains like Algae and mold it may be that it just needs a good cleaning. At Eastbrook Construction, our guys will give you a free quote and honest answers on getting your roof replaced, repaired or even just cleaned. We work with homeowners and contractors on new construction homes, as well as, installing roofs on custom homes. If your building your first home or your last, trust us to be your professional roofing contractor on your new home. Residential homes in Brighton using GAF Shingles can expect the highest quality and expertise in roofing solutions. Do you need help with your roofing decision? Our trusted roofing professionals will provide you with different options to customize a beautiful looking roof for your home. Making it easy to choose the color, style and the shingle configuration desired for your new roof. If your searching for local roofing companies near me, and you live near Brighton MI, Contact us or call 248-877-9247 and to get answers to your questions or set up an appointment to visit your home. 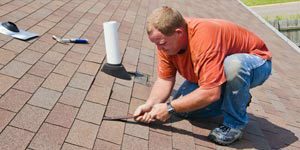 We can help you every step of the way in your roofing repairs or replacement. Then, you can enjoy the rest of the summer and feel happy and secure under your new roof going into the fall and those other indoor months! This entry was posted in Roofing Company, Roofing Contractor and tagged local roofing company, roofing contractors near Brighton, Roofing repairs. Bookmark the permalink.